North America has a comprehensive Paleogene fossil record of birds, of which however no up-to-date reviews exist. In chronological order, the North American Paleogene is divided into the following land mammal ages (after Prothero 1994 and Rose 2006; age estimates after Alroy 2000): The Paleocene comprises the Puercan (65-63.3 Ma), Torrejonian (63.3-60.2 Ma), Tiffanian (60.2-56.8 Ma), and Clarkforkian (56.8-55.4 Ma). The Eocene is subdivided into the early Eocene Wasatchian (55.4-50.3 Ma), the early/middle Eocene Bridgerian (50.3-46.2 Ma), the middle Eocene Uintan (46.2-42.0 Ma) and Duchesnean (42.0-38.0 Ma), and the late Eocene Chadronian (38.0-33.9 Ma) land mammal ages. The Oligocene is composed of the early Oligocene Orellan (33.9-33.3 Ma) and Whitneyan (33.3-30.8 Ma), and the late Oligocene Arikareean, which begins at 30.8 Ma and extends into the Neogene. The Cretaceous-Paleogene transition is covered by the marine sediments of the Navesink and Hornerstown Formations of New Jersey. Whereas the Navesink Formation is of late Cretaceous (Maastrichtian) age, the upper parts of the Hornerstown Formation were deposited in the Paleocene (Parris and Hope 2002). Unfortunately, most avian specimens come from the basal part of the Hornerstown Formation, whose age is more controversial and is either latest Cretaceous or earliest Paleocene (Olson 1994; Parris and Hope 2002). Bird bones were also reported from the late Paleocene (Tiffanian) marine Aquia Formation of Maryland and Virginia (Olson 1994), and from early Tiffanian fluviolacustrine beds of the Wannagan Creek Quarry of North Dakota (Benson 1999). After refinement of the collection techniques (Houde 1988), the early Eocene (latest Wasatchian to early Bridgerian) sediments of the Willwood Formation of the Bighorn Basin in Wyoming yielded a great number of fossil birds, many of which are still undescribed (see Table 4.2 in Feduccia 1999). Isolated avian bones were also described from the early Eocene (ca. 53 Ma) Nanjemoy Formation of Virginia in eastern North America (Olson 1999a). These deposits are of marine origin, but similar to those of the London Clay also include remains of land birds. Certainly the most renowned North American locality for early Eocene bird skeletons, however, is the Green River Formation of Wyoming, Colorado, and Utah (Grande 1980; see Table 4.2 in Feduccia 1999; Weidig 2003). Its deposits represent the sediments of three lakes, Lake Gosiute, Lake Uinta, and Fossil Lake, which existed, at least in parts, from the late Paleocene to the middle Eocene. Most nonpresbyornithid fossil birds come from Fossil Lake, which was smaller and much deeper than the other two lakes, and whose existence was confined to the early Eocene (late Wasatchian; Grande 1980). The sediments of the middle Eocene (Bridgerian) Bridger Formation of the Green River Basin in southwestern Wyoming originated in different depositional environments, including river channels, floodplains, and lakes, and most birds are represented by isolated bones. Important North American localities for middle Eocene to late Oligocene bird fossils are situated in the extensively eroded badlands of South Dakota, Colorado, Wyoming, Nebraska, and Utah. According to the revised biostratigraphy (Prothero 1994), the White River Group of the badlands is formed by the middle Eocene (Uintan) Uinta Formation, the late Eocene (Chadronian) Chadron Formation, and the Oligocene Brule Formation, which is divided into the Orellan Scenic Member and the Whitneyan Poleslide Member (Prothero and Emry 1996; Terry et al. 1998; Stoffer 2003). The paleoenvironment of these localities is characterized by an increasing aridity toward the Oligocene. Whereas there were dense forests in the late Eocene, wooded grassland occurred in the early Oligocene, and rather dry open grasslands dominated in the late Oligocene (see p. 153 in Prothero 1994). 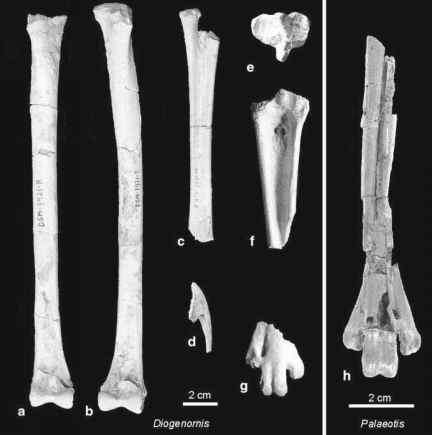 A few avian fossils were also found in the latest Eocene (34 Ma) fluviolacustrine deposits of the Florissant Fossil Beds National Monument in Colorado, and are of particular interest as they consist of articulated skeletons (Chandler 1999; Ksepka and Clarke 2009).